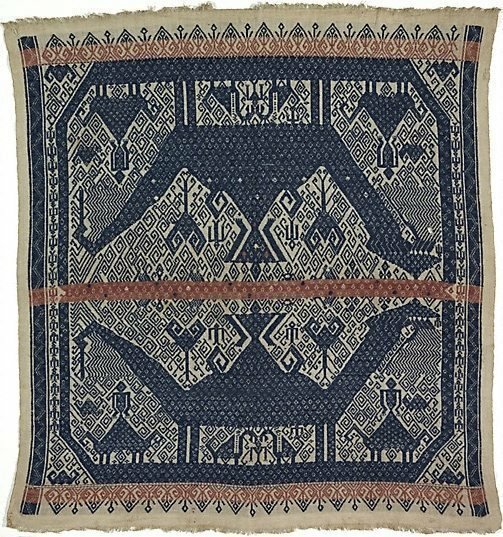 This tampan displays mirror images in blue supplementary weft yarn. Standing, stylised human figures and trees surmount mythical animals that have heads on the right and tails on the left. Smaller repetitions of this image are located in the corners of the central panel. Beneath each of the large images are two small mythical creatures, and the mamuli-like form of the main human figures is reflected in the bud forms of the top and bottom edges of the panel. Hook shapes and zig-zag lines fill the background and provide borders for the central image. The three red bands divide and frame the imagery, focusing the gaze on the large figures. Large images combined with simple borders that include paired dots are typical of Komering tampans.